About Us - Upper Delaware Council, Inc. 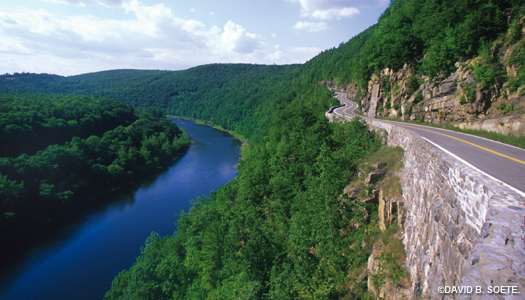 The Upper Delaware Council, Inc. (UDC) was unique in the world of river conservation and management when established in 1988 because it represented a formal partnership of local, state, and federal governments and agencies which have joined together to manage the Upper Delaware Scenic and Recreational River, a true national treasure. The Council’s existence evolved from special provisions in the 1978 legislation which designated the Upper Delaware River as a component of the National Wild and Scenic Rivers System, and called for development of a management plan and a program providing for the coordinated implementation and administration of the plan. To that end, the Upper Delaware Council (UDC) was formed in 1988. What sets this River Management Plan apart is the commitment to local land use controls and voluntary actions by landowners to protect the resources on their own private property, as opposed to federal ownership of the land in the river corridor. As the driving force behind the River Management Plan, the UDC provides a mechanism to address actions by local, state, and federal agencies which affect the river valley. Over the past 30 years, the UDC has enjoyed remarkable success, having prevented significant incompatible uses proposed for the river valley, often before the proposal left the drawing board. UDC committees and staff have worked with corridor towns and townships right from the beginning to ensure that control of the Upper Delaware Scenic and Recreational River stays in local hands, our river valley voice is heard, and that the character of the corridor — in which more than 85% of the land is privately-owned – remains unique in the realm of federally-protected rivers. The UDC is classified as a non-profit, tax-exempt organization under IRS Code Section 501(c)(3). It is incorporated in the Commonwealth of Pennsylvania and registered to do business in New York State as well. Contributions are tax-deductible to the extent allowed by law. The Council membership operates under a long-term, renewable Cooperative Agreement with the National Park Service. Voting members are the two states (New York and Pennsylvania) and presently 13 out of the 15 local governments which border on the Upper Delaware River. In New York, these include the Town of Hancock in Delaware County, and Towns of Fremont, Delaware, Cochecton, Tusten, Highland, and Lumberland in Sullivan County, and the Town of Deerpark in Orange County. In Pennsylvania, members are the Townships of Berlin and Damascus in Wayne County, and Townships of Lackawaxen, Shohola, and Westfall in Pike County. The Delaware River Basin Commission is a non-voting member of the Council. The Wayne County Townships of Buckingham and Manchester are eligible to join the Council as voting members, but have not. Services to members include reviews of development projects, ordinances, and governmental initiatives; advocacy; and administration of some pass-through state grant programs. The Council also administers a Technical Assistance Grants (TAG) program, publishes “The Upper Delaware” twice-annual newsletter, offers the “Visitor Information Map and Guide for Touring the Upper Delaware Scenic and Recreational River: New York and Pennsylvania” brochure, sponsors educational programs, organizes an annual raft trip to promote river UDC brochure stewardship, and holds an annual awards ceremony to honor river valley contributors. The UDC’s Business Office is located at 211 Bridge Street in Narrowsburg. The full Council meets on the first Thursday of every month. Three standing committees — Water Use/Resource Management, Project Review, and Operations — also convene monthly. All meetings of the Council are open to the public. Since 1988, the Upper Delaware Council has awarded a cumulative $868,575 to member municipalities through its Technical Assistance Grant program to carry out 253 projects related to implementation of the River Management Plan for the Upper Delaware Scenic and Recreational River.